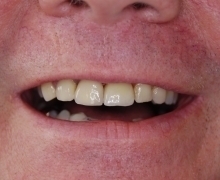 This gentleman had been troubled by a crowned anterior tooth for many years . This eventually led to the loss of the tooth and he presented to us requesting an implant replacement. This image is of the patient following the replacement of the anterior tooth with an implant and the restoration of this with a porcelain crown. For information the tooth replaced was his upper left central incisor.